A charred tomato and pomegranate barbecue sauce is the perfect combination of sweet and slightly spicy and slightly smoky. 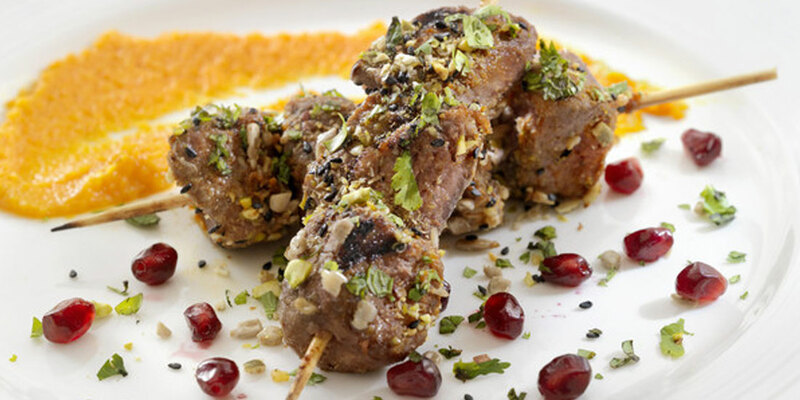 It is brushed over the cooked beef skewers to serve and sprinkle with Dukkah to garnish. Dukkah is an Egyptian condiment consisting of a mixture of herbs, nuts and spices. Use any leftover sauce to serve with lots of other dishes: scrambled eggs, a cheese tray or even grilled cheese sandwiches. Use leftover dukkah to garnish any appetizer plate or sprinkle over yogurt, cottage cheese or a salad of mixed greens. Look for pomegranate molasses in the international section of your local grocery store. In food processor, combine parsley leaves, pistachios, sesame seeds, pumpkin seeds, sunflower seeds, fennel seeds, cumin and thyme. Pulse to combine. Place in zipper-type bag. (Make-ahead: refrigerate for up to 1 month.) Thread beef strips onto 12 skewers. Broil or grill until pink in the center, about 4 minutes per side. To serve: brush with Sauce and sprinkle with dukkah. Serve remaining sauce on the side for dipping. 1 lb (500 g) of steak makes about 20 skewers. You can also cut steak into kabob cubes if desired.